After the first edition of the IFAU 2017 – International Forum on Architecture and Urbanism organised in December 2017 Tirana, the Università degli Studi G. d’Annunzio Chieti-Pescara - Dipartimento di Architettura (DdA) and the Polytechnic University of Tirana – Faculty of Architecture and Urbanism (FAU) are organising the second edition: IFAU 2018 – International Forum on Architecture and Urbanism in Pescara, Italy on November 8 - 10, 2018, with the theme “Fragile Territories”. 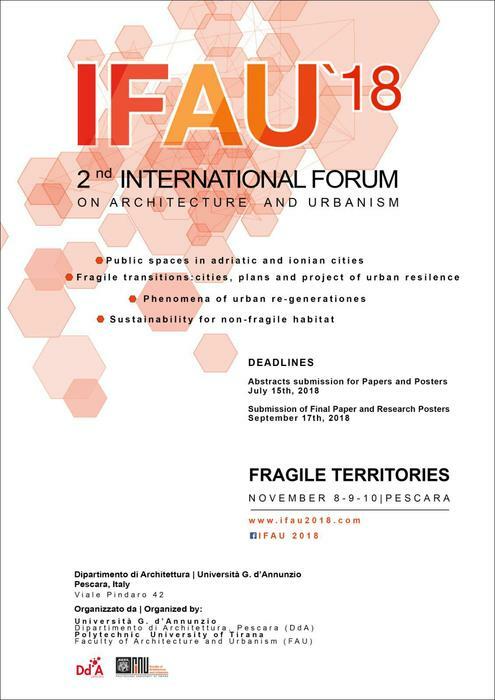 IFAU 2018 – 2nd International Forum on Architecture and Urbanism aims to bring together leading Academic scientists, Researchers, and Scholars to exchange and share their experiences and research results about all aspects related to Landscapes, Cities and Architecture within "Fragile Territories". It also provides the premier interdisciplinary forum for researchers, practitioners, and educators to present and discuss the most recent innovations, trends, and concerns, practical challenges encountered and the solutions adopted for the Fragile Territories in Cities in Transition. The Forum will be structured as a Call for Papers / Call for Posters subject to peer review by a team of professors from the promoting Universities. All accepted Papers and Posters will be presented during the FORUM and included in a peer-reviewed volume complete with an ISBN code in the “Architectural Studies and Research” series published by Gangemi Editori. Only the authors of the accepted Papers and Posters will pay a Registration Fee by October 15th 2018. The IFAU 2018 will take place in PESCARA (Italy) at the Department of Architecture - Università G. d’Annunzio, Viale Pindaro 42, Pescara on November 8 th-10 th, 2018.